Discover wheatgrass benefits for the body, skin, hair and scalp! It's green in color with a sweet and strong taste. It’s grown from embryonic seeds of the Red Wheat Berry, a special strain of wheat. Wheatgrass is one of the most nutrient dense substances on Earth. It’s available as fresh produce, in powder concentrate, tablet, capsule and juice forms. History traces wheatgrass back 5000 years, to ancient Egyptian times. It became popular in the USA around the 1940’s, after Charles F. Schnabel popularized the plant with experiments in previous years. Anne Wigmore, (founder of the Hippocrates Health Institute), was a strong advocate of wheatgrass consumption, as part of a raw food diet. Wheatgrass advocates endured criticism for years, since limited scientific evidence supports their claims of health benefits. Even through criticism, many health institutes still endorse wheatgrass advocates to this day. Advocates of wheatgrass claim it treats various health concerns: anemia, diabetes, cancer, constipation, infections, eczema, psoriasis, ulcerative colitis, joint pain, weight gain and more. Its main proponent of health benefits is concentrated chlorophyll, about 70%. Chlorophyll benefits the body by: purification, deodorizing, reducing inflammation, renewing blood cells and tissue. Wheatgrass is gluten free, unlike wheat. 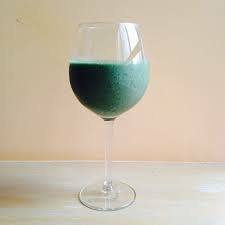 Add a small amount of wheatgrass juice to smoothie or juicing recipes. You can drink wheatgrass juice by itself, but careful, you don't need much. 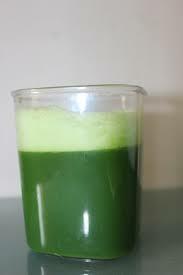 If you’re not used to drinking wheatgrass juice, begin slowly by drinking only one ounce or less a day. It can make you nauseous if you drink too much at once. You may not want to drink it everyday and that's fine. If you’re trying to combat a degenerative disease, 4 - 6 ounces of wheatgrass juice, per day, is plenty. CAUTION! Wheatgrass is generally safe but it can have side effects including: hives, swollen throat, headaches and nausea. If you’re breast feeding or pregnant avoid wheatgrass or wheatgrass juice, until your medical health provider approves your use. RECIPE #1: Use wheatgrass powder as a skin cleanser and exfoliant. RECIPE #2: Mix wheatgrass powder with milk to form a paste. Apply to acne, pimples or blackheads. Rinse with water and gently pat dry. Avoid eyes and ears or any sensitive area. RECIPE #3: Apply wheatgrass juice directly to skin. (Skin may temporarily stain a green color). RECIPE #1: Drink wheatgrass juice, regularly. RECIPE #2: Rinse hair with wheatgrass powder. RECIPE #3: Add wheatgrass powder to shampoo when applying to hair. GROWING WHEATGRASS and WHEATGRASS PRODUCTS! HOW TO GROW WHEATGRASS AT HOME!